Goodgame Studios hits turnover of 1 billion with knights and cows! As the managers of one of Germany’s biggest gaming companies, the Wawrzinek brothers often found themselves in the same position as their players on their way to making a million: seeds that were sown did not always germinate; patience, fighting spirit and lots of strategic skill were necessary. After a phase of enormous growth in 2014 and 2015, they managed with blood, sweat and tears, tough cutbacks and restructuring in 2016, to get Goodgame Studios back on course in 2017. “It was absolutely essential for us to focus again fully on our core brands of EMPIRE and BIG FARM,” says Dr. Christian Wawrzinek. “Only in this way were we able to achieve turnaround, and we are now once again on a course of growth.” The successful launch of the mobile game “BIG FARM: MOBILE HARVEST” underlines this statement. In less than one month, the game has been installed over 2 million times worldwide. 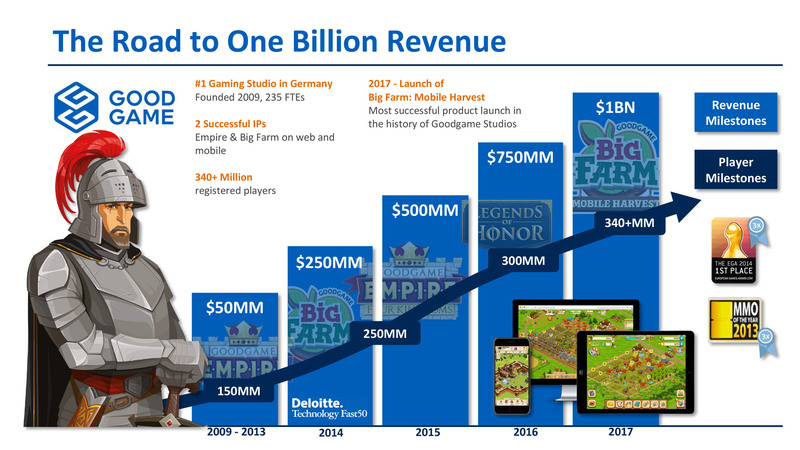 In the fantastic world of BIG FARM, one can only become a successful farmer with business skills, the right strategy and a strong community – and those are the principles to which the team at Goodgame Studios also adhere when it comes to continuing the company’s steep upward curve in the future.